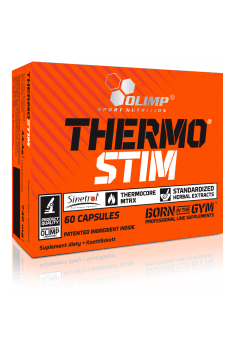 Olimp Thermo Stim is a Fat Burner supplement based on natural ingredients, intensifying thermogenesis of the body. The combination of the patented SINETROL® and THERMOCORE MTRX™ formulas has been enriched with vitamins C, B5 and B6, which are involved in the metabolism of nutrients. The supplement promotes the creation of a calorific deficit and intensifies lipolysis, thanks to which it is possible to use the excess fat as a source of energy. Orange extract (Citrus aurantium var. dulcis) - its active ingredients intensify thermogenesis, which affects the increased energy expenditure and acceleration of the metabolic rate. In addition, by inhibiting the phosphodiesterase, it allows a long-term maintenance of a high concentration of cAMP, involved in lipolysis. Grapefruit extract (Citrus grandis) - contains a powerful dose of antioxidants and effectively intensifies AMPK kinase activity, which speeds up the metabolic rate and promotes the weight loss. The fruit also effectively reduces the appetite, and the studies show its beneficial effect on the regulation of the glucose and insulin metabolism. Red orange extract (Citrus sinensis L. Osbeck) - is characterized by a larger amount of beta-carotene, giving the pulp a red colour. In addition to increasing thermogenesis and lipolysis, it has beneficial effects on the health of the cardiovascular system and also shows strong antioxidant properties. Guarana extract (Paulinia cupana L.) - a source of caffeine that is slowly released over time and which intensifies thermogenesis and lipolysis. It helps reduce the amount of calories consumed, improves mood and increases the perceived energy level. Bitter orange extract (Citrus Aurantium L.) - its active ingredients (synephrine, hesperidin, naringin and octopamine) stimulate lipolysis and intensify thermogenesis of the body. Extract from this fruit also facilitates the use of fatty acids as a source of energy, effectively improving the body composition. Green tea extract (Camelia sinensis L.) (55% EGCG) epigallocatechin contained in green tea, acting in synergy with caffeine, intensify the metabolic rate and stimulate lipolysis. Green tea also has antioxidant properties that regulate blood glucose as well as reduce appetite. Cocoa extract (Theobroma cacao L.) (20% of theobromine) - cocoa regulates the level of glucose in the blood and improves the sensitivity of tissues to insulin, promoting the reduction of body fat. Theobromine raises the level of cAMP, stimulates the release of neurotransmitters responsible for well-being and reduces the perceived level of fatigue. Natural extract from raspberry ketones (Rubus ideaus L.) (98% of ketones) - raspberry ketones have a similar chemical structure to capsaicin, and thus can intensify thermogenesis of the body. The studies showed that taking raspberry ketones increases the production of adiponectin fat cells, which positively affects insulin sensitivity and correlates with a reduced BMI index. Cayenne pepper extract (Capsicum annuum L.) (8% of capsaicin) - capsaicin enhances the release of adrenaline, which stimulates the lipolysis process and also increases the heat production in the body. Consumption of capsaicin is associated with an increase in daily energy expenditure and may prevent fat gain in people who consume excess calories. Ginger extract (Zingiber officinale L.) (5% of gingerol) - ginger has warming properties, and its consumption increases the energy expenditure and activity of enzymes responsible for oxidation of fatty acids. Gingerol contained in ginger also have anti-inflammatory and antioxidant properties. This chemical compound also improves the functioning of the digestive system. Green coffee extract (Coffea arabica L.) (50% of chlorogenic acid) - chlorogenic acid contained in green coffee favours the regulation of the glucose-insulin management of the body. This polyphenol promotes the production of heat in the body and reduces the absorption of fatty acids from the gastrointestinal tract. It inhibits their formation and intensifies the beta-oxidation process. Black pepper extract Bioperine® (Piper nigrum L.) (95% of piperine) - the content of piperine allows to increase the production of gastric acid and the blood flow to the lower part of the digestive system, which promotes the absorption of nutrients. In addition, black pepper extract inhibits the formation of new fat cells, increases the metabolic rate and regulates the glucose metabolism of the body. Caffeine - purine alkaloid with ergogenic properties. It increases the release of adrenaline and noradrenaline, which are involved in the lipolysis process. In addition, caffeine promotes the use of fatty acids as the preferred source of energy and reduces appetite and delays the appearance of fatigue. Vitamin C - as a supplier of electrons to the body, it increases the activity of the body's antioxidant barrier. This vitamin also participates in the synthesis of collagen and L-carnitine, which allows the crossing of fatty acids into the interior of the mitochondrion. Vitamin B6 - essential for the proper functioning of the nervous system, production of neurotransmitters and hormones. This vitamin is involved in the metabolism of nutrients and enables the efficient energy production in the body. Pantothenic acid (or vitamin B5) participates in the transformation of carbohydrates and fats and has a positive effect on the level of cholesterol in the blood. Pantothenic acid supports the functioning of the liver and can contribute to lowering the stress level in the body. In conclusion, Olimp Thermo Stim effectively helps fight the excessive levels of body fat. Its active ingredients contribute to the intensification of heat production, the lipolysis process and the use of fatty acids as a source of energy. This supplement based on natural ingredients facilitates the creation of a caloric deficit and helps reduce appetite, which helps reduce body fat. Taken 1-3 capsules a day with a lot of water, 30 minutes before breakfast, dinner and training. No need to use the preparation on non-workout days. Do not exceed the recommended daily portion and do not use for night. No not use simultaneously with other preparations with similar effects. In case of the users, who have never used fat burners before, it is recommended to start from half a recommended dose for the period of 2 weeks and then gradually increase the dose. Bulking agent - microcrystalline cellulose, anti-caking agent - magnesium salts of fatty acids, capsule (gelatin - capsule component, color: E171). Fruits - in the botanical sense of the word - are a plant organ,developed of ovarium, post or bottom of the flower producing seeds and constitutes their natural cover. Most of them are products of trees and shrubs (except fruit of herbaceous plants such as blueberry, strawberry, strawberry pineapple). For culinary purposes it is the edible part of the plant. The most popular fruits are apples, plums, oranges, bananas, strawberries, blueberries, and a number of other fruits. Most of them are suitable for consumption in the raw state, characterized by a sweet taste, and even sweet, up to sour. Some can be eaten throughout the year (e.g. in the form of frozen foods), or make of them processed juices, compotes, jam and jams. Fruits are a source of vitamins, in particular ascorbic acid and beta-carotene. In their composition are flavonoids, fibre and minerals. In the the majority they are low-calorie. They contain easily digestible sugars. Extracts from powdered fruits, vitamin complexes, available at www.muscle-zone.pl.